In honor of Sunday-Selfie, a picture of my angel, Mr. Jazz – the inspiration for Rainbow Bridge Remembrance Day. Rainbow Bridge Remembrance Day is on August 28 and for those of you who might want to participate in some manner, I wanted to share a few details in advance. 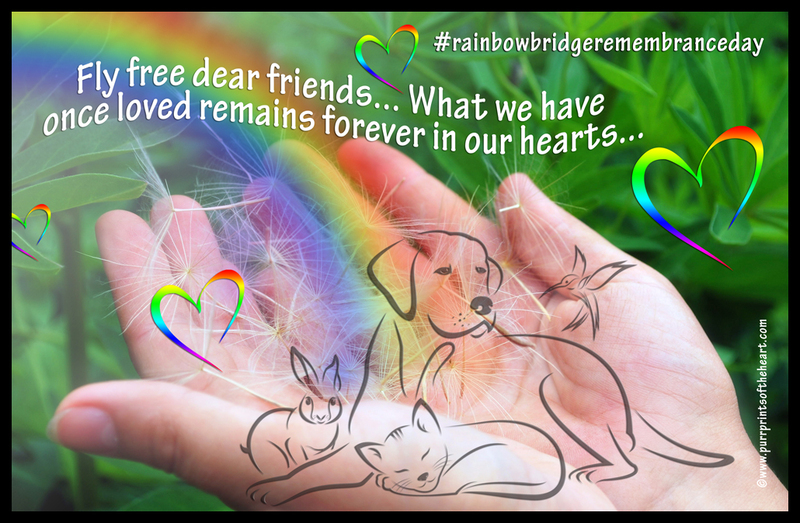 First off, the brief history of the day – I founded Rainbow Bridge Remembrance Day (RBRD) in 2015 as a special day for pet guardians to honor the memory of those beloved pets in their life they have loved and lost, but never forgotten – whether fur, fin, feathers, scales or something else. 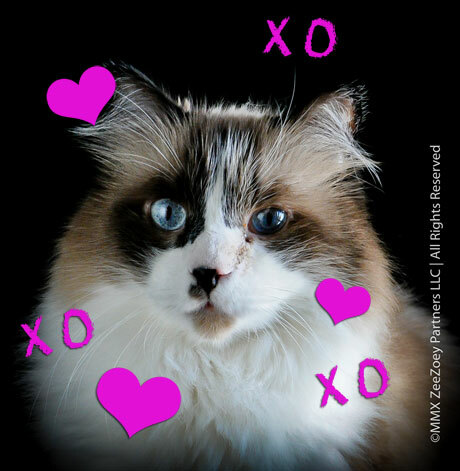 It’s held every year on August 28, in honor of the day I had to say goodbye to my precious Ragdoll cat, Mr. Jazz, the meow author of Purr Prints of the Heart – A Cat’s Tale of Life, Death, and Beyond. Secondly, as with every year, there is no pressure to participate. I don’t want to make anyone uncomfortable, as I know it’s a sad day. But it’s also a beautiful day. The outpouring of love I see every year is so touching, as people share in the love they have for their pet(s) and it’s a time when we can all take a moment to collectively come together and comfort one another. Every year I host a blog hop – the post will go live at 12:00 a.m., EST, on August 28 with the code and linking information available at that time. I have also created a Facebook event page for those who want to post a picture, write a poem, share a favorite memory, upload a video, or share a blog post link. This is the event link: https://bit.ly/2n5c0T1. Please feel free to invite others you think might want to be a part of the day. I created a new logo for the event last year and this will be the official logo moving forward. If anyone does not have it and would like to use it, please email me at info@zeezoey.com and I’ll forward it to you. There is no requirement to use the logo – this day comes from the heart, so please do whatever is most comfortable for you. 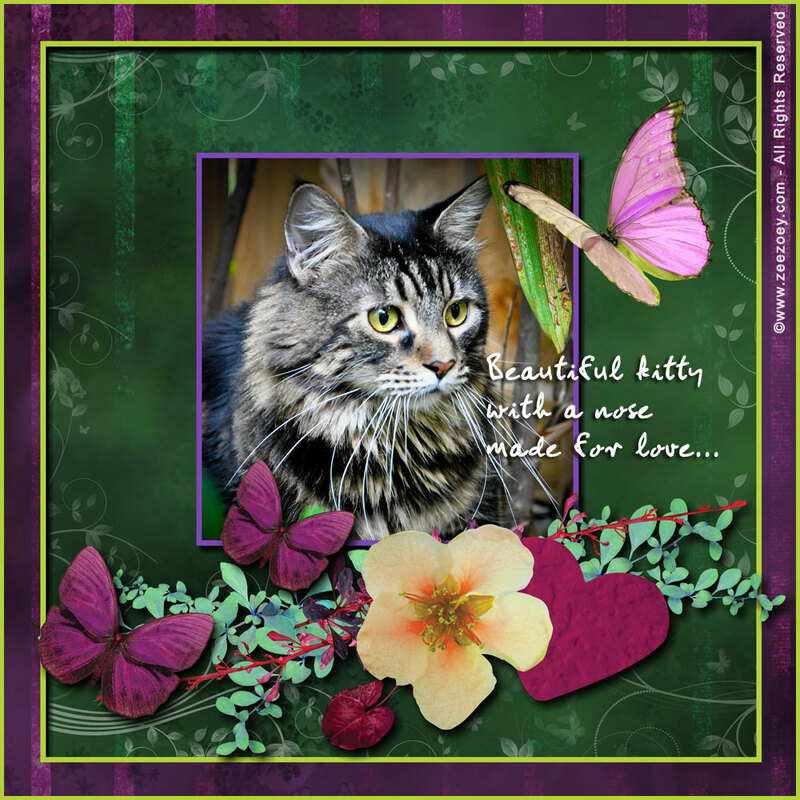 If you’ll be sharing on Facebook, Twitter, Instagram or other social venues, you can use the hashtag #rainbowbridgeremembranceday and if you’re crediting me for founding the day in any of your posts, please reference me as Deb Barnes of Zee and Zoey’s Cat Chronicles, author of Purr Prints of the Heart and founder of Rainbow Bridge Remembrance Day. Thank you, everyone – my heart goes out to all of you who have loved and lost a pet. Wishes for a peaceful Sunday to all. Zee is precious in every way – even his nose is heart shaped! Zee & Zoey’s Custom Cat Ears and More for POP Cats Miami on October 28! 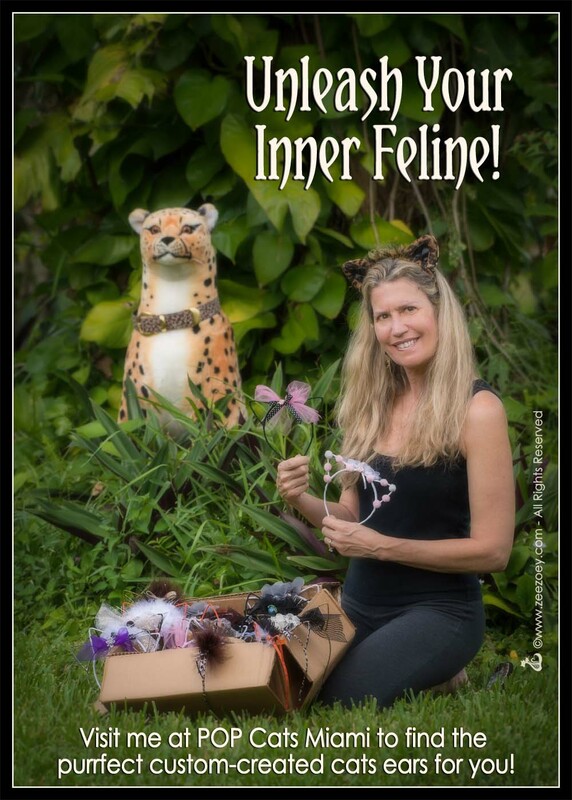 I’m a crafty person by nature, so it was bound to happen one of these days… Yup, I’ve designed my own line of custom-created cat ears, so that you too, can unleash your inner feline! 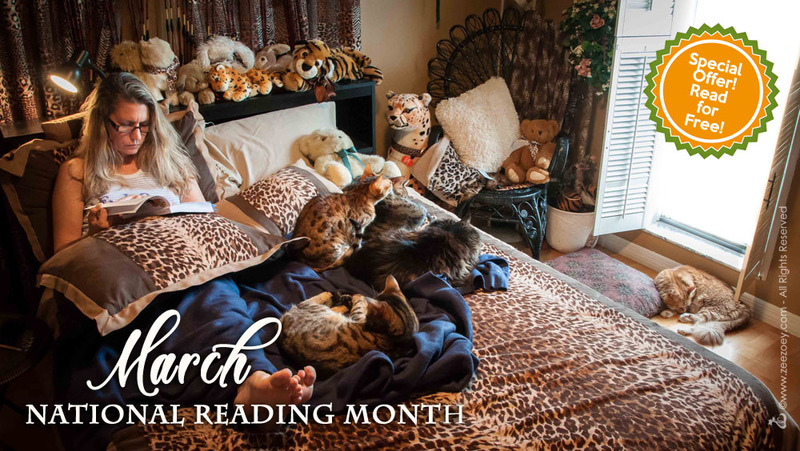 It’s no secret I’m known as the “leopard lady.” It’s also no secret that I love to wear cat ears, to the point if I didn’t wear them (along with my leopard garb) at cat-related events, I’m not sure if people would know who I was! I decided to take my cat ear loving passion to task and have been a busy little kitty creating custom cat ears of my own to sell at POP Cats Miami, a venue I will be attending this October 28 from 11:00 a.m. to 7:00 p.m. From black cats, white cats, spotted, striped, and everything in between, there’s sure to be a style to tickle your feline fancy! If you’re in the South Florida area I really hope you’ll think about attending. 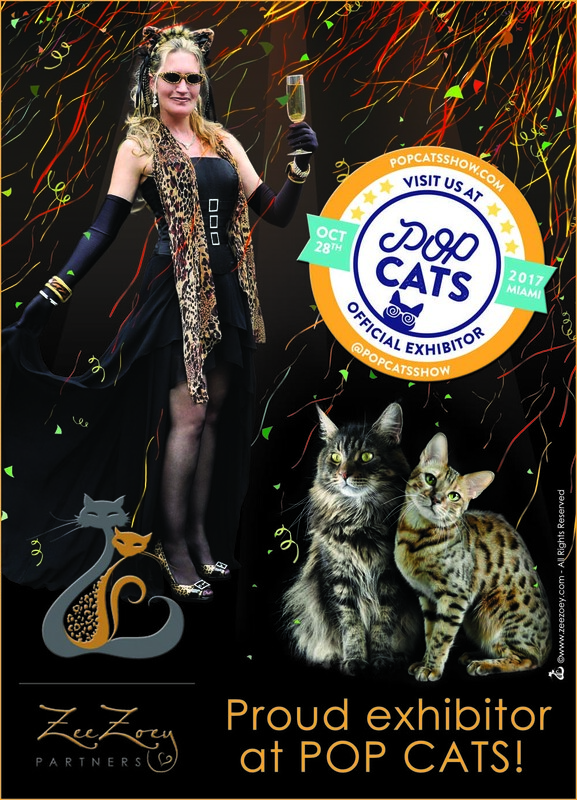 It’s a cat lovers dream come true under one convenient roof where you’ll be able to shop and find unique, fun, and creative merchandise for cats and humans from your favorite brands from the pop-culture world. 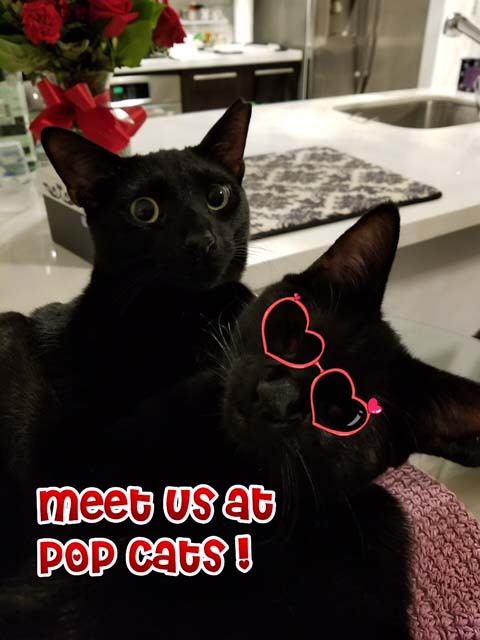 Unfortunately Zee and Zoey won’t be joining me at POP Cats, but there will be lots of great cats up for adoption at the event! Need gifts for birthday’s, Christmas, and the like? Want something for yourself? This is the place to be! There will also be a cat-riffic lounge that will feature adoptable cats you can interact with and a portion of ticket proceeds will benefit one of my favorite 501c organizations, The Cat Network, Inc.
I’ll be there, unveiling my handmade cat ears, along with a new t-shirt I designed (with coffee mugs and magnets to match) as well as with all of my books at a special discounted event rate (The Chronicles of Zee & Zoey – A Journey of the Extraordinarily Ordinary; Purr Prints of the Heart – A Cat’s Tale of Life, Death, and Beyond; and Makin’ Biscuits – Weird Cat Habits and the Even Weirder Habits of the Humans Who Love Them) for those who would like autographs. Please excuse the dreadful picture – it was raining outside and I didn’t want to get the camera wet! 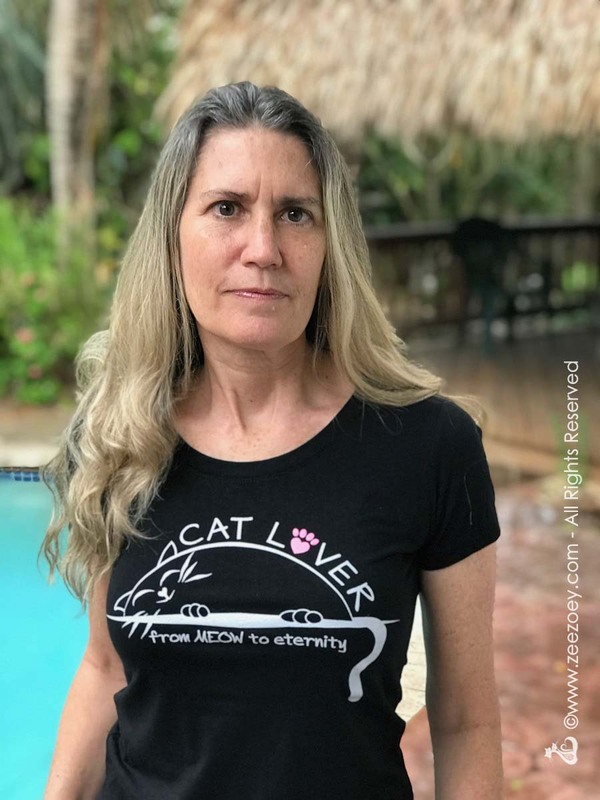 This is my newest creation – the “Cat Lover from MEOW to eternity” T-shirt! Author of 3 books and contributing author to another…I would have never dreamed it possible years ago when I started blogging in 2010! 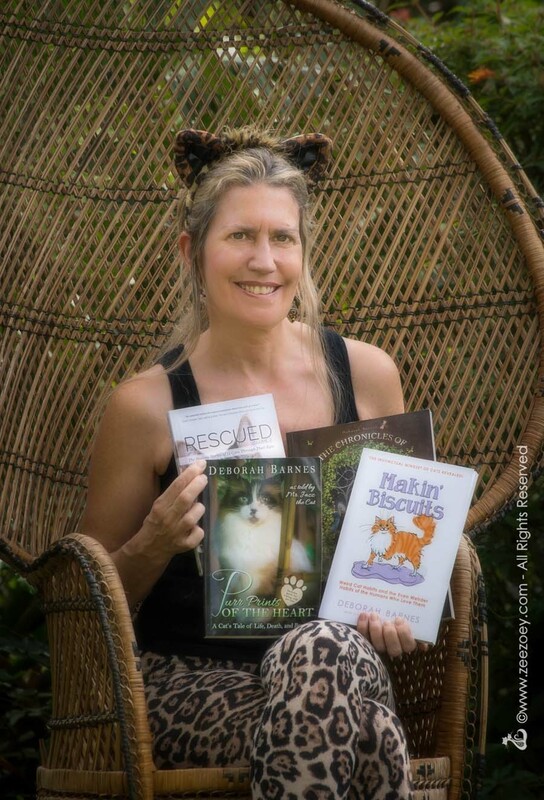 And even better, I’ll be donating $5.00 from each sale of the book, Rescued Volume 2: The Healing Stories of 12 Cats, Through Their Eyes, to Riverfront Cats, a Miami rescue organization that promotes cat rescue, focusing on black cats which are often overlooked for adoptions. Our rescue Jazmine is one of the featured stories in the book and I’m so honored to be able to help Riverfront Cats out. Jazmine is doing a double-take at the cover of Rescued, Volume 2 because yes, she’s one of the kitties on the cover! 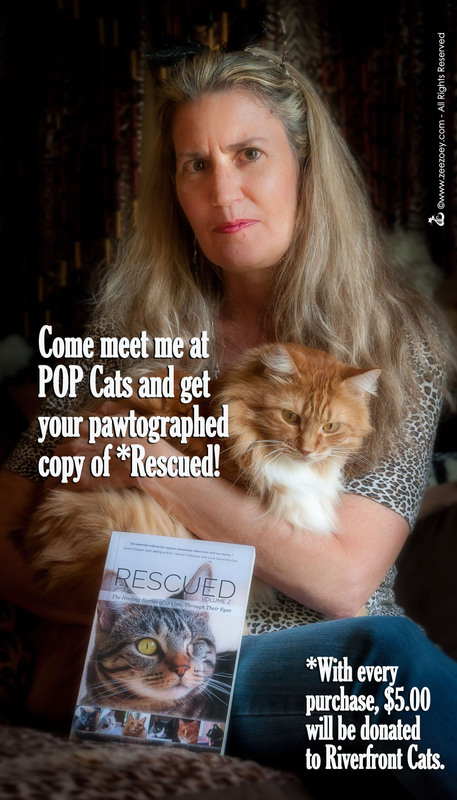 Speaking of Riverfront Cats, Christine Michaels, founder of the organization and my dear friend will also be with me at POP Cats. That alone is reason enough to attend! And she’ll be bringing two of her black cat fosters who are up for adoption – Rocky and Ray Ray! We’ll also be featuring several raffles to raise funds for her 501c organization, Pawsitivley Humane, and, of course, we’ll be educating the public on all sorts of cat topics like spay/neuter, TNR, and more. This is Rocky and Ray Ray. Ray Ray is sporting the cool shades and is a special needs cat, as he is blind. Christine promises they’ll both steal your heart and we hope to find them loving furever homes at POP Cats! Photo courtesy of Riverfront Cats. If you’d like to go, click the link for ticket details – plug in the special code ZZPC at checkout and you’ll receive a 10% discount off your order! Hope to see you there!